An enjoyable fish out of water cop movie, this film works mainly because of eddie murphy’s comedy and some pretty good action as well. A fun detective movie with Eddie Murphy really showcasing how talented he is as a comedian. This is the usual buddy cop movie minus the buddy, with Murphy doing it all on his own. when his friend who is visiting from Beverly Hills is killed, murphy’s Axel Foley hops a plane and flies to california to catch the killer himself. As it happens, this leads to a whole conspiracy of corruption. The action is good, but nothing special. It’s the comedy that really makes this movie standout. 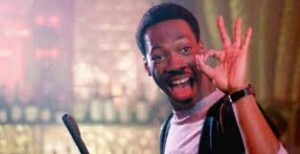 Beverly Hills Cop is a fun movie. It’s a wisecracking cop movie where there’s a mystery and a lone renegade who goes off on his own to conduct an investigation away from the department and ruffles more than a few feathers in the process. This is Eddie Murphy doing some of his best work. It’s a buddy cop movie without the buddy. Murphy made the buddy cop film two years earlier, when he broke out in the movie 48 Hours. Than the studio said, “Let’s see if he can do the same thing without a partner, and carry the movie all by himself.” Murphy accepted the challenge and easily pulled it off. 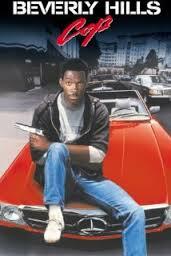 The movie is about Axel Foley, a Detroit cop, who witnesses a murder where the killers are from out of town. He had a friend visiting him from Beverly Hills and the friend made a few enemies while out there. Now these guys come and kill him and Foley decides the murder might have happened in Detroit, but the killers are on their way back to California. He quickly tells his boss he’s taking some vacation time and then hops a plane and heads out to the west coast. The first portions of the movie all establish Axel as an irresponsible, wild card. He starts out undercover, trying to conduct a stolen goods deal until the police show up and chase him around. They’re also chasing the two guys he was making the deal with who now drive a truck that plows through everything in sight. It’s a cool opening action scene, but by the end of it, Axel is in a lot of trouble. The whole investigation and undercover operation he was running was unauthorized. On top of that, they destroyed a whole tone of city property and civilian vehicles. So much of this opening was copied by the movie rush hour. In that film, it’s again a buddy cop situation, but it also opens with tons of city damage during a car chase and a police chief who’s less than thrilled about it. After Axle’s friend is killed and he tells his chief he’s taking some time off, the chief warns him that if he goes anywhere near the investigation, it will be a permanent vacation and he won’t be coming back. That doesn’t stop axel. He heads right for Beverly Hills to get things started. Once there, he quickly finds a woman named jenny that set his friend up with a job. The job was working security for a high-end art dealer. Axel gets that dealer’s name ands address and heads over to his office building. Watching axel get past security is one of the most fun parts about this movie. Here, at the art dealer, Victor’s office, he insists on bringing a delivery up to him, himself. Later on, at a private club, Axel pretends to be a gay lover trying to deliver a message that the man inside needs to get tested fro sexually transmitted diseases immediately. Naturally they let him into the club to deliver that message himself. At Victor’s office, axel asks a few quick questions and then is approached by a large group of security guards. They lift axel up, carry him back downstairs, and then hurl him through a glass window. That’s when a police car shows up and throws him in the back seat. Axel is taken to the station where he meets the Beverly Hills cops and tells his side of the story. The movie has a lot of fun here, watching axel walk through the Beverly Hills police station and admire how nice it is compared to where he works in Detroit. There are phones in every prison cell, for example, and when a police officer punches axel for mouthing up, a higher up approaches axel immediately asking if would like to press charges. Axel tells the police who he is and what he’s up to, but it seems like they don’t want any part of this investigation. Instead, all they really do is tail him to his hotel and then run a stakeout, waiting for him to come back outside. Axel orders room service delivery to come to their car and than puts a banana in their tail pipe before taking off. The movie becomes about axel continuing to break into victor’s properties in order to investigate him, and also about him convincing the cops to help him out. It seems like every time he convinces the guy he needs to, a higher up figure arrives on the scene to knock him back down and refuse to allow the police department to help him in any way. Still, axel can be very convincing, and judge Reinhold’s character, in particular, is always willing to come along. The mystery itself isn’t all that mysterious, since we see who the killer is in that beginning Detroit murder. The story isn’t anything all that special either. Sure, the action is good, but it also just boils down to mostly guys firing off machine guns and missing their targets. The thing that makes this movie work, more than anything else, is Eddie Murphy. He has real presence here and his timing and wit make every scene good for a few laughs. Beverly Hills Cop went on to spawn two sequels, (48 Hours went on to have a sequel as well), and it’s not really that surprising to see why. This is a Murphy in one of his most perfectly cast role. He’s natural as the rebellious cop who cracks jokes every moment he’s not running for his life. Without the humor, this movie would not have worked at all. It would have been just another routine cop action movie with a limited plot. But Murphy and what he brings to the table here are what really carry this film and put it in a category all to it’s own. It’s the buddy cop movie without the buddy and Murphy pulls it off better than anybody else.